A confession to start: this isn’t the book I was supposed to do this week. I’m trying to do them in series order so You’re a Good Friend Noddy should have come first. 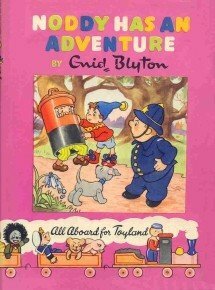 But Noddy Has an Adventure is what I promised on Monday and so that’s what I’ve read. It seems tradition for Noddy books to start with him getting up in the morning and having his milk delivered by the milkman who takes payment in making Noddy’s head nod. This time however it begins with him going to bed at night, then sleeping right through the milkman’s visit the next morning. His heavy sleep isn’t much of an alibi, though, when Big Ears comes rather angrily to his door, complaining that someone’s stolen all of his washing. What has that got to do with Noddy? you ask. Well, Big Ears happened to hear a car during the night, one that made a parp-parp noise just like Noddy’s little car does. The next morning Mr Big-Bear discovers all his flowers have been stolen and again, Noddy’s car has been heard nearby. Mr Plod is soon on the case and you know what’s coming, don’t you? Yep – Noddy’s being blamed. I have to say he seems a very poor policeman. Surely he knows by now that Noddy’s no criminal, no matter how many times he is accused of various crimes? You might almost put him on a par with Mr Goon, only he doesn’t have a hatred for Noddy. 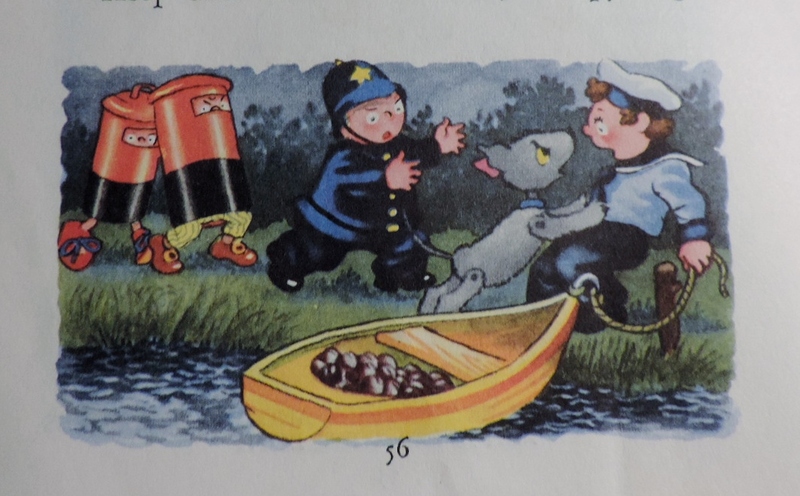 Thankfully Noddy has friends, and Bumpy-Dog (from Noddy Meets Bumpy-Dog) returns, taking on a Buster-type role and sending the annoying policeman packing. Tessie Bear is there as well, as she looks after Bumpy dog and they hatch a plan to prove Noddy is innocent. His alibi this time will be that he has stayed at Tessie Bear’s house overnight. If any crimes occur then they can’t have had anything to do with him. Tessie Bear’s Uncle Bear is there, and he tells them the story of The Three Bears who he claims were relatives of his! 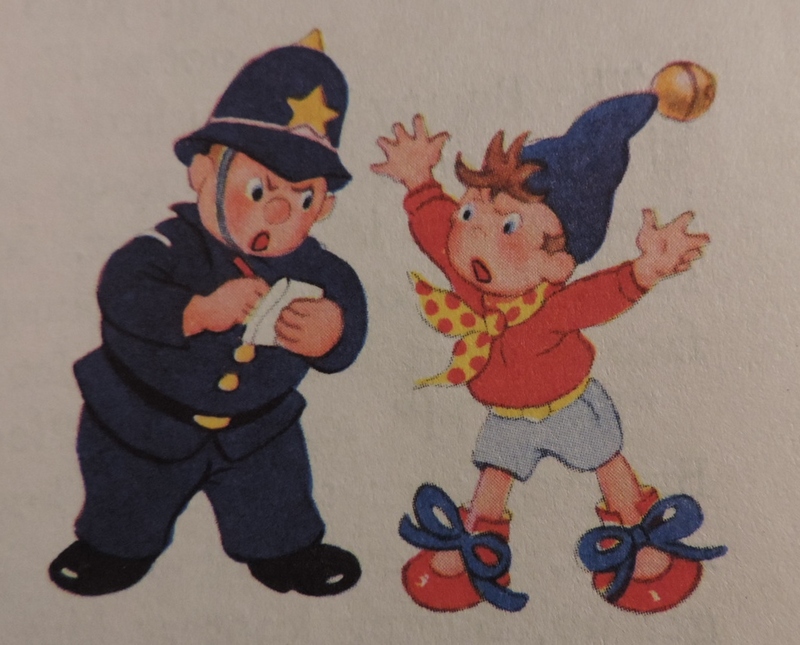 The upshot is that Mr Plod is ‘glad’ that Noddy’s not to blame for the theft of the plums from Mr Golly’s orchard that night, and drops all investigations into him. There’s still the mystery of the car that sounds like Noddy’s, though. And what’s even more mysterious is that he discovers his car is all muddy… as if it’s been driven through an orchard, perhaps. But it has been locked in his garage the whole time and he is very insistent that he always locks his car away safely at night. 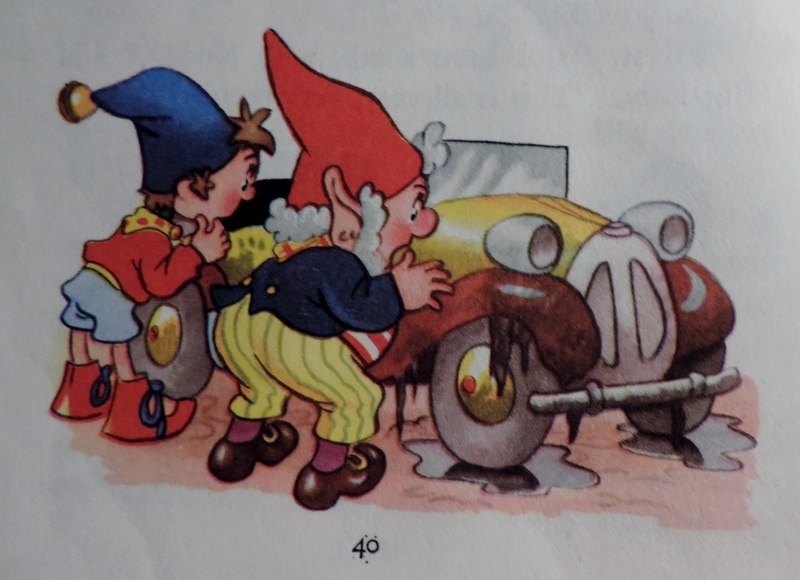 Unfortunately the juicy mystery is somewhat spoiled when Noddy suddenly announces that oh, yes, he did have two keys for the garage but recently lost one. It seems a bit of a lazy solution that didn’t require any effort on Noddy’s part to work out. It’s somewhat redeemed by the idea he and Big-Ears come up with to catch the thief, however. In a sort of Blue Peter Make moment they use paper, paint and dustbin lids to create post boxes to hide in. 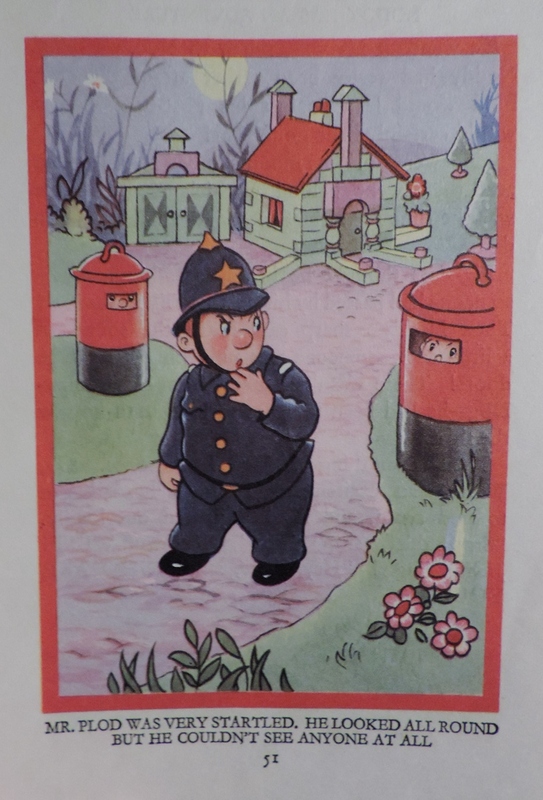 They must do a good job as Mr Plod passes and doesn’t see anything amiss (even though two brand new post boxes have appeared on either side of the road outside Noddy’s house). The thief doesn’t realise, either, and ends up being chased by a pair of post boxes with legs. The book has some good points like the ending, and the three bears story but also has weaker elements like Noddy’s lost key. It’s not one of the best in the series for me, but it’s not a bad read. This entry was posted in Book reviews and tagged Mr Goon, Mr Plod, Noddy, Noddy Has an Adventure. Bookmark the permalink. Thank you, Fiona – I do like your Noddy reviews. As a child I used to want Noddy to marry Tessie Bear so that she could look after him!